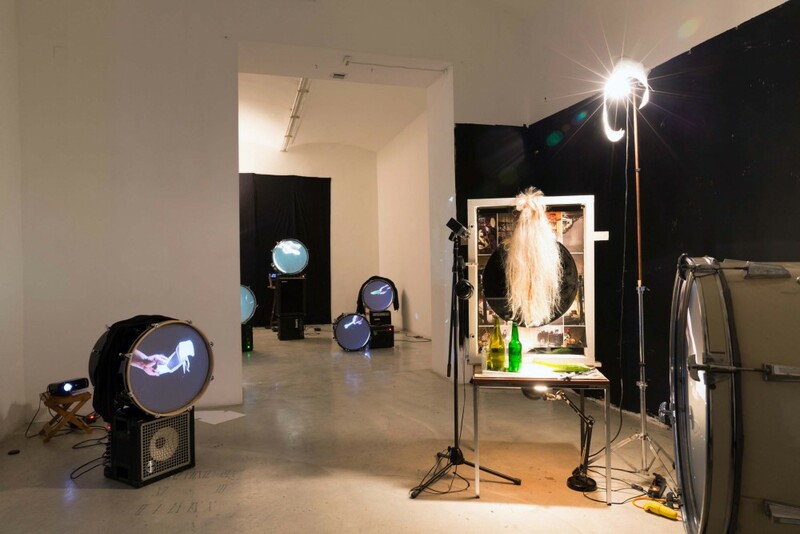 Albert Mayr is a 41 year old artist from Vienna who makes installations and does performances which often involve sound, but he never made an actual record. That’s going to change soon though. Your work from ten years ago was more trashy and chaotic (in the style of Paul McCarthy or Mike Kelley) than your recent work. Why did you evolve in a cleaner, clearer way of working? Really? You think so? I am not sure about that. Maybe the photographs are better now. But on the other hand: after some years you have tried out a lot of stuff, than you try new things, new techniques, new materials. Maybe that results in a kind of cleaner appearance of the work, you sort things out. And talking of messy art installations: my favorite is Jason Rhoades. Unfortunately he is dead already. Your ‘Bassdrumparty’ and ‘Drums and Sprinklers’ installations made me think: there’s what a bassdrum is supposed to be used for, but this is what it can be used for. Is this what you try to do with your work: extend the idea of what is possible? I like to collect things. That has a lot to do with the way I work. If I like something I keep it. If there is a reason or not. In my studio I like to be surrounded by all that stuff. That’s the material I use for my work. Some things are there for years until I see a use or an idea in it. Sometimes it never happens. I am kind of a collector. I think it’s not so much about what is possible, it’s more about what makes sense, what is a coherent way to use it. My first reaction when I see your work is often: smile. So to ask my questions: does humor belong in music (or art)? Not necessarily, but for sure you can’t exclude it. But don’t confuse it with a joke, it’s not about being funny. I think humor is a kind of intelligence. Why is there often link to music or sound in your sculptures? In music there are so many elements to play with beside from the sound. There is a technical point of view, social elements (or antisocial), graphic language, behavior, gestures, expectations of the audience, drugs or even architectural elements like a stage or a stand. Sound or music is a system that helps me building sculptures. And maybe the most important: I like it! You often use the same elements in your work. Do you think that a young artist is influenced by others but after a while, your own work becomes your main reference? The possibilities you have as an artist are endless, so it’s good to find your own vocabulary…it’s about what you are interested in and what you can do best. The ‘Ironing board disensemble’ could have been a John Olson invention. ‘How to play a painting’ could have been a Lucas Abela performance. Are you influenced by noise, especially the US noise scene from mid 2000? I like that but it has not really been an influence. 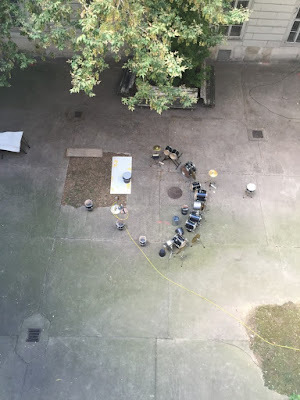 There is a quiet active experimental music scene in Vienna too. I really like to listen to noise music, specially live. I love when the sound gets physical. The idea for ‘Ironing board disensemble’ was to bring two things together: I often thought there is kind of a gap between the heavy sound and the performer on the stage hardly moving. You could think he’s checking his mails. 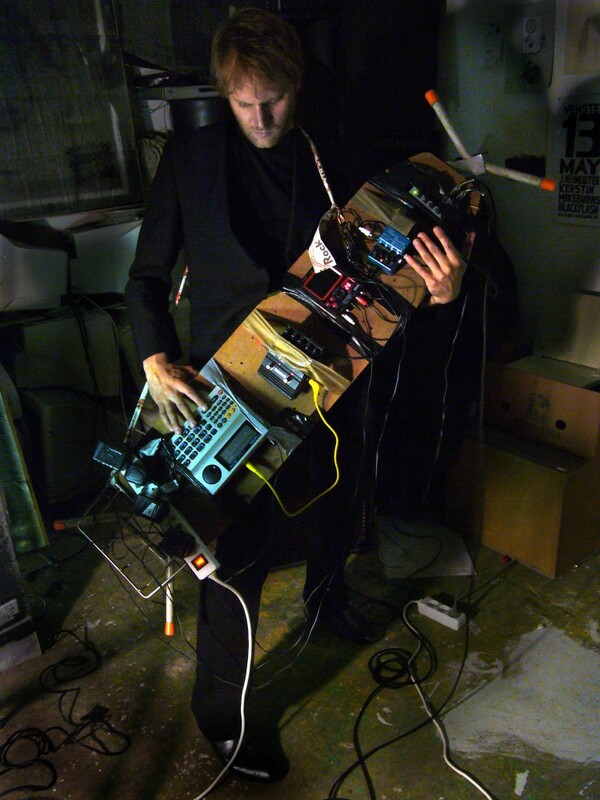 So I mounted all the devices on an ironing board which you could hang around your neck like a guitar and pose like a guitarplayer wanking of on a solo. I suppose everybody grew up with pop music, with idea of music as ‘the song’, with the idea of a catchy melody or a nice rhythm. So when you work with music and sound the way you do, you must have moved away from the idea of music as songs. Where, when and how did this change happen for you? Did you ever play music ‘the normal way’: learning the chords to ‘Let It Be’ on a guitar? Forming a band with local friends? I always liked to make music more than listening to it. It is still like this. I don’t listen to a lot of music. I grew up in a quit musical house: both of my older brothers played in the local marching band. One of them still is a professional horn player. My parents only listened to classical music and they thought I also should play an instrument. They suggested the flute so I tried it. One day while rehearsing I freaked out and broke the flute by hitting it on the edge of the table. It had a 90 degree bend and I stopped playing. Maybe it is because I know you’re Austrian that your performances remind me of Viennese Actionism, that your readymades reminds me of Erwin Wurm or Frans West, or that your humor reminds me of Ernst Jandl, Gerhard Ruhm or Dominik Steiger, but do you think that there is something that makes your work Austrian? Of course there is an influence, because I did not grow up in the jungle. Actually that would also have an influence, quiet a big one. Your environment always influences you in one or the other way. So I would say my work is Austrian because it’s made in Austria and I am Austrian. But who cares. And thanks for comparing me to these guys. Some of them I like a lot. I think Franz West had a great humor. I heard that Austria only has one real city, which is Vienna. Where did you grew up? Sankt Pölten? Was moving to Vienna ‘the most logical option’, maybe the only option? Yeah, you lived in Krems so you know how it is! 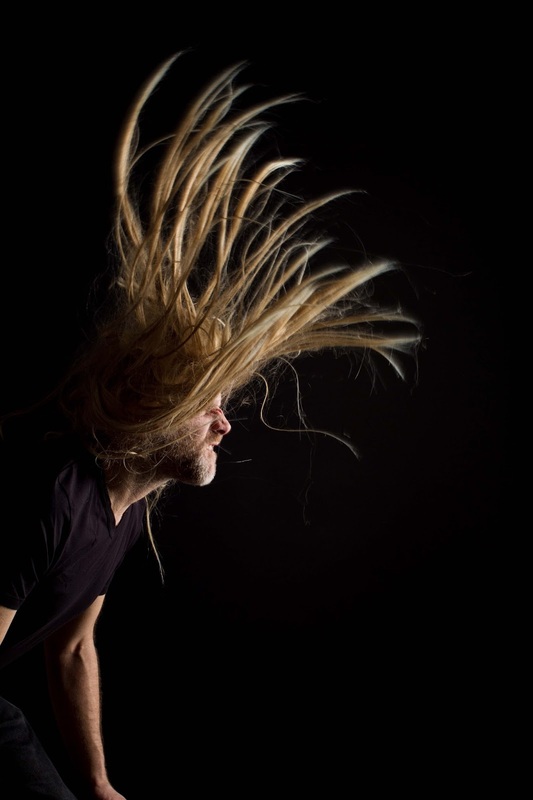 You present your music as sound installations and as performances, but never on record. Don’t you think your music would work on record? I actually will release two records. Both will be sounds from installations I did lately. One will be the sound of a waterdrop installation, the other one rhythms from the bassdrumparty in Antwerp. In these two installations the sound is more independent than in my former performances. There it was more about how the sound is produced and the whole performance itself. The sound was mostly very loud and harsh. That was part of the concept that it should be more physical. It was made to be played live for an audience. I think it wouldn´t make sense to conserve only the sound without the rest. Music often is: volume, tone and a duration, time. The ‘Drums and Sprinklers’ installation is a loop, in a way. Do you think listening to a loop demands a different kind of concentration? A performance demands a performer. A sound installation is in a way a performance without a performer. Do you think that, if you leave away the person, that the music becomes less personal? Or should music not be about the person, but about the sound? I can´t tell you what music should be about but for sure it always personal. For example: if you watch a tingerly machine making sound, for me that´s very personal.